Chicken Patties Filled with Corn and Zucchini. An Easy Lunch! These zucchini chicken patties are so simple and flavorful! You can make these ahead of time for the whole week. What a simple lunch! These don’t take too much thinking and you can always add in more veggies, too! Try adding celery or spinach. Season with cumin or paprika to switch up the flavors. These are totally customizable. These zucchini chicken patties would also be great in between a bun with some lettuce. Such an easy sandwich! Easy Lunches for Your Toddler. You’ll Never Run Out of Lunch Ideas Again! 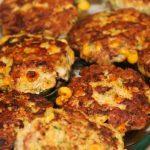 These chicken patties are filled with a healthy dose of zucchini and corn! Make them ahead of time for an easy lunch for the whole week. Start off by grating your zucchini. You can peel the skin off but I like to leave it on for added nutrients and color! Once done, place in a colander and sprinkle with 1 tsp salt. Mix it up and let stand for 10-15 minutes. This will help remove some water! After 10-15 minutes, place in a kitchen towel and ring out as much water as possible. I usually aim for doing this 3 times until there's no water dripping at all! Then you can just discard the zucchini water. In a large bowl, place the zucchini and season with the other tsp salt and the tsp pepper. Then add the chicken. I like to mix the two at this point. Next, add the green onion, the minced garlic, and corn. I give this another mix. Last, I add the binders. Crack the egg and pour the 1/2 breadcrumbs and give this one final mix. Once mixed, form them into patties. You can make them as big or as small as you want. Have them ready for cooking on the stovetop makes this so much easier! In a large skillet (the largest you have so you can cook a bunch) heat 2 tbsp of olive oil over medium-high heat. Place 3-4 patties in at a time so that you can cook multiple but careful not to over crowd the pan. Cook for 3-4 minutes, until browned on the first side. Flip over, and do the same for the rest. If your pan seems dry in between batches, feel free to add more oil. Keeping that heat medium-high creates that great brown color while still cooking the chicken through. Make sure not to move them too much or they won't brown! You can serve these in between a bun as a sandwich or as the entree on its own! Perfect for lunch and meal prepping. Enjoy!